Greplin is getting a facelift and a new name, Cue, a moniker designed to reflect its new shift away from personal data search toward personal data organization. Customers downloading or upgrading to the new Cue iPhone app (s aapl) or accessing Cue from the Web can still search their email, social media, calendar and cloud storage accounts from a single interface. 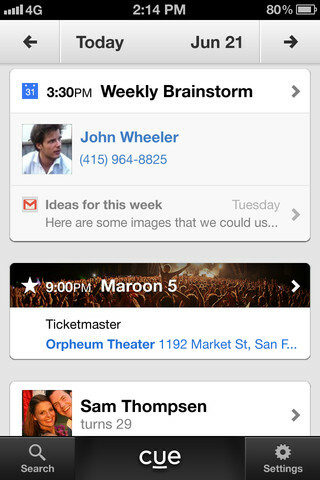 The difference is Cue is now proactively organizing that data into an intelligent snapshot of your day. Through a single calendar interface, Cue aggregates all the emails, phone numbers and addresses related to an appointment. Cue integrates reservations, travel plans and even package delivery into the interface, letting you change or cancel a meal reservation, check into flights, track the arrival of a shipment with a few clicks. Cue’s contact list updates as your friends and associates update their info in social media. Displayed alongside each contact’s name are their recent posts on Facebook and Twitter. We built Greplin because people are constantly inundated by more and more things that require their attention. But even with lightning fast search, it was still becoming impossible to keep up with the daily barrage of emails, contacts, calendars, tweets, posts, files and more. That’s why we decided to build Cue: a service that will make all of that technology work for you, instead of the other way around. Cue is the best way for you to contact the people you care about, get where you’re going, and stay informed. We’ve changed our name to reflect the direction of our new service. Like Greplin, Cue has a free service allowing you to link Gmail(s goog), Google Docs, Google Calendar, Google Contacts, Yahoo Mail(s yhoo), Dropbox, Twitter, Facebook(s fb), LinkedIn(s lnkd). By referring new customers, Cue users can add additional services like Reddit, Pinboard, Delicious, Tumblr and Google Reader. Cue is also available as a premium paid app, which gives customers automatic access to the referral accounts as well as Evernote, Salesforce(s crm), Yammer, and Basecamp. Young entrepreneurs Daniel Gross and Robby Walker founded Greplin in 2010, the same year it closed a $4.8 million Series A round, which was led by Sequoia Capital but also happened to include Bret Taylor, the now departed CTO of Facebook. Frankly, this idea sounds just as useless as their previous product.